First of all, I sure hope these instructions don’t confuse the heck out of you. Second, this is a really fun thing to make! 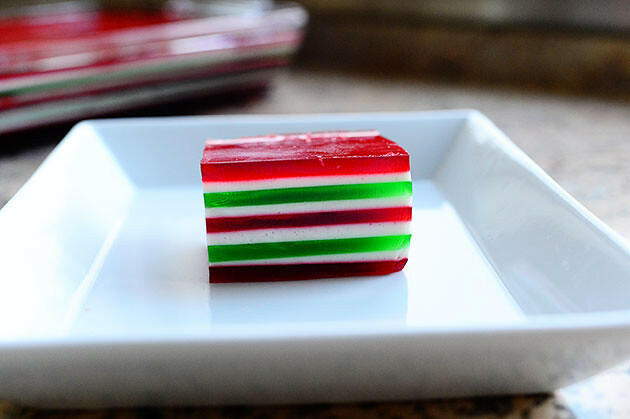 It’s a Christmas version of the classic “Finger Jello”recipe, which I believe refers to any jello that is supplemented by an additional dose of plain gelatin, which renders it a little more hardy and easy to pick up with one’s fingers than regular jello would be. 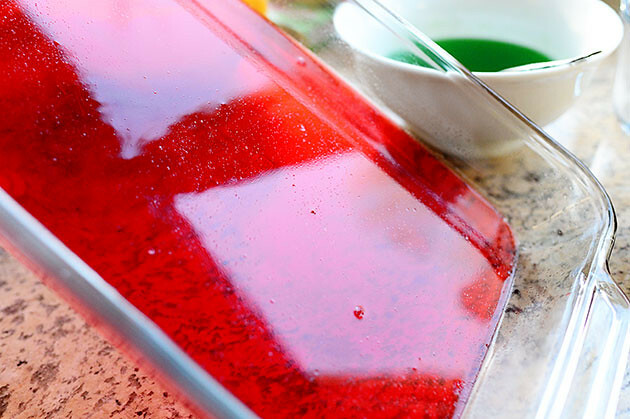 Rainbow Finger Jello involves layering several different colors of the gelatin-fortified jello, which results in an amazingly happy and pretty layered treat. A couple of weeks ago, I whipped up a cute Christmas version. The kids loved it. But I think I wound up eating more squares than anyone. I kept walking by the fridge, and popping squares in my mouth. Repeatedly. Till they were all gone. I seem to do that a lot. 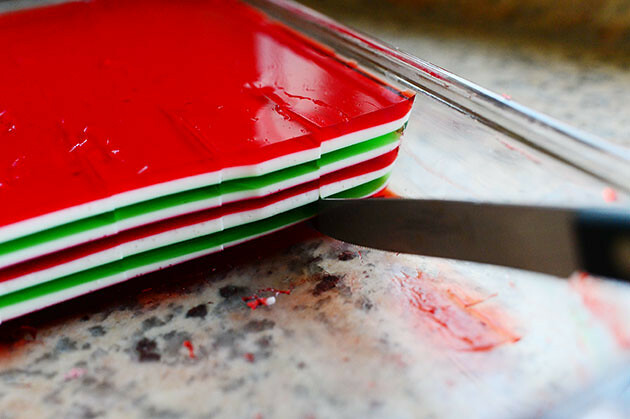 Five boxes of jello: 3 red and 2 green. And nine envelopes of plain gelatin. There are usually four to a box. Okay, I’m going to take a deep breath now so I’ll be able to explain this in a relatively coherent fashion. Please light a candle for me. 1. This whole process will take you about 2 to 3 hours. Emphasis on 3 1/2. 2. The more organized/prepared you are ahead of time, the more smoothly it will go. 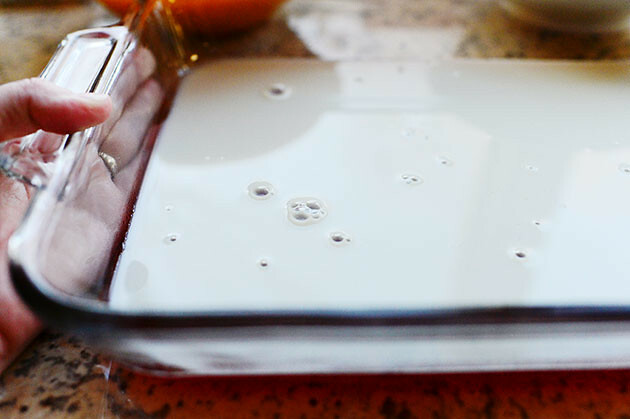 Lay out mixing bowls, glass measuring cups, and fill up a tea kettle if you have one. You’ll need a continual stream of boiling water. 3. I did nine layers in total, but you can do as few as five or as many as 43,000…as long as the pan will hold them. 4. Be sure to spray your pan (9 x 13 inch) with cooking spray before you start. If you don’t, the bottom layer will definitely stick to the pan. 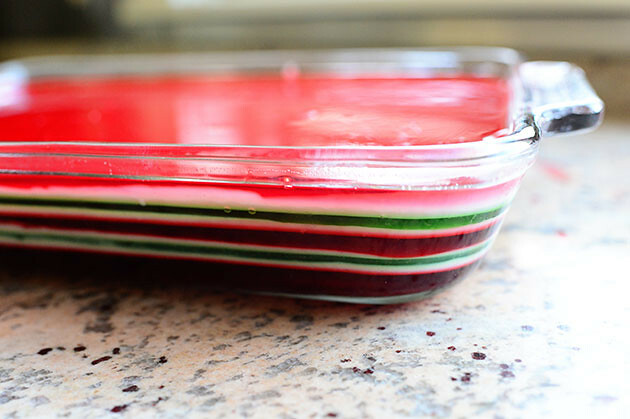 We’ll start with the colored jello layer. 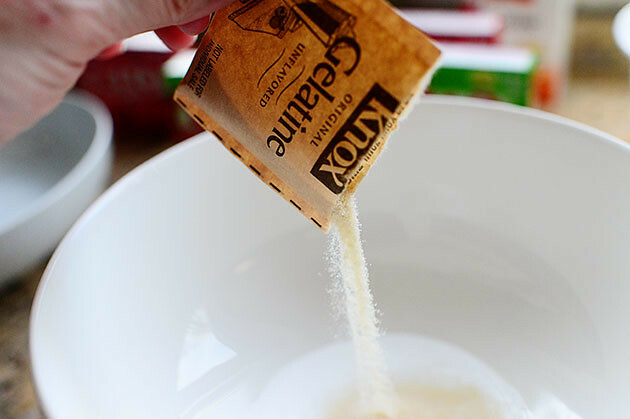 And pour it into a small mixing bowl. 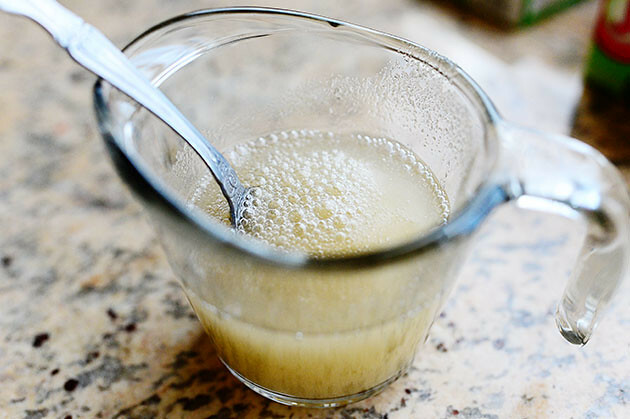 And stir it to dissolve. It’ll quickly start to set and look gelatinous. Then pour it into the pan. Right next to your cattle vaccines. Now, the first layer just needs to chill out for 10 to 15 minutes to set. 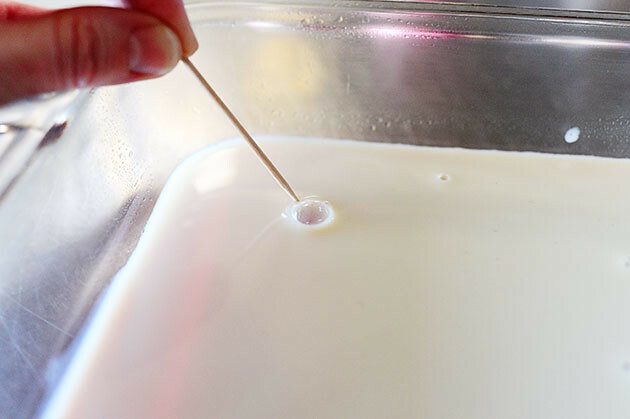 While that’s chilling, make the first batch of the creamy layer (which will cover 2 to 3 layers!) 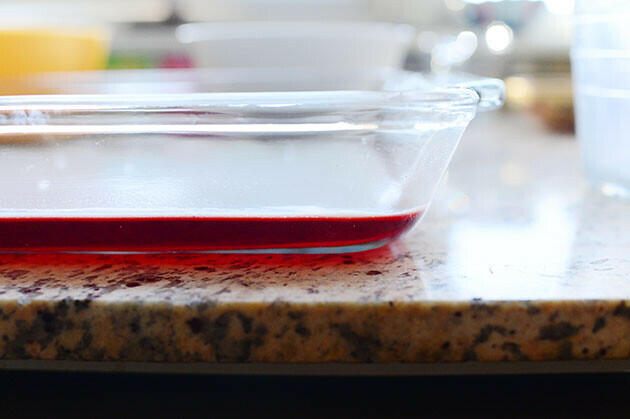 In a small measuring cup, measure 1/2 cup of cold water and pour in 2 envelopes of plain gelatin. 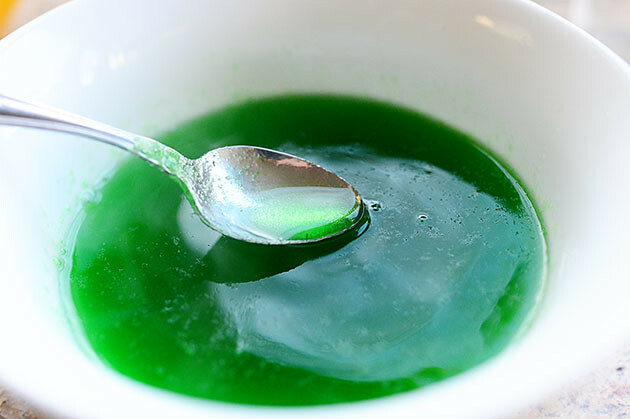 Stir it around to dissolve the gelatin, then set it aside. 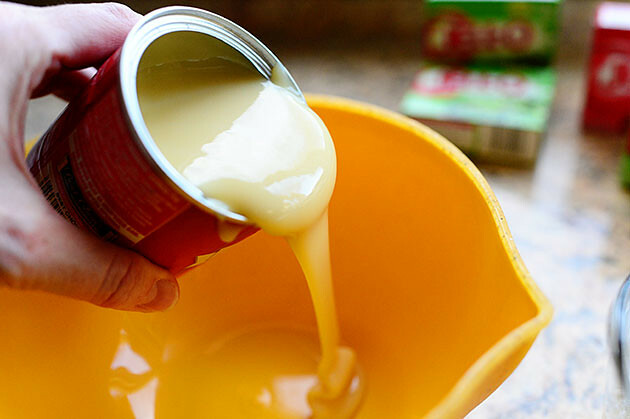 In a separate bowl, pour one can of sweetened condensed milk. 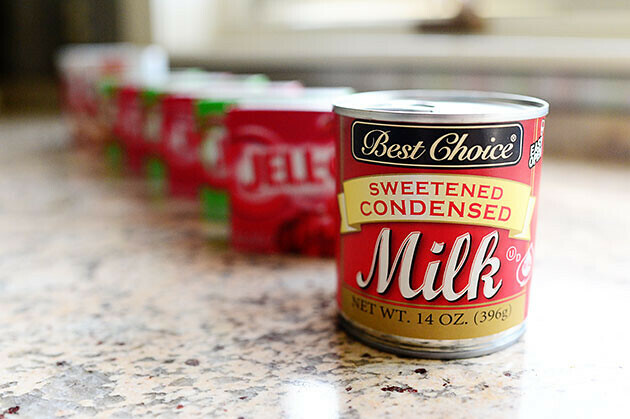 I love sweetened condensed milk. I’m sure that comes as no surprise to you. 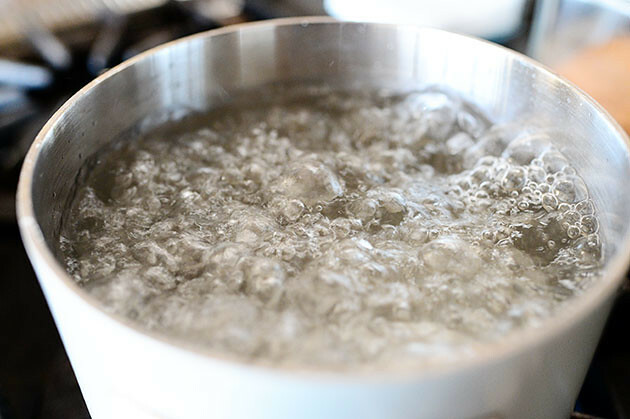 Grab a cup of boiling water and pour it into the bowl. 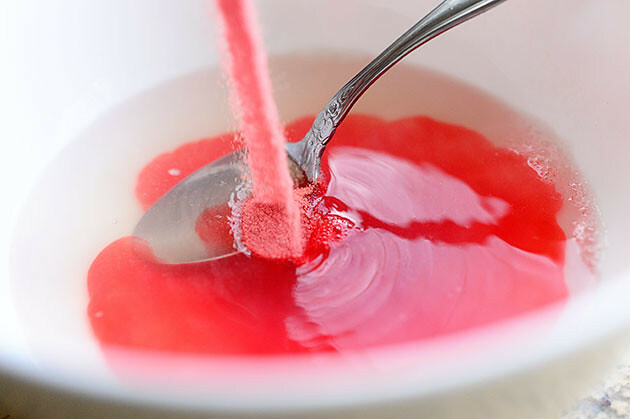 Then pour in the dissolved gelatin, stir it around, and add another 1/2 cup of boiling water. 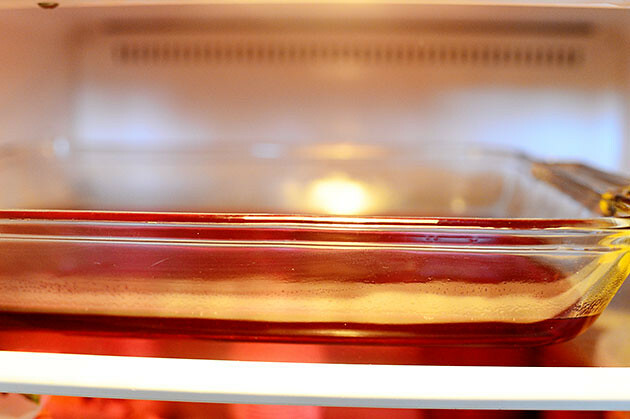 Pull the first jello layer out of the fridge. This is me tipping the pan on its side to make sure it was, like, totally set. 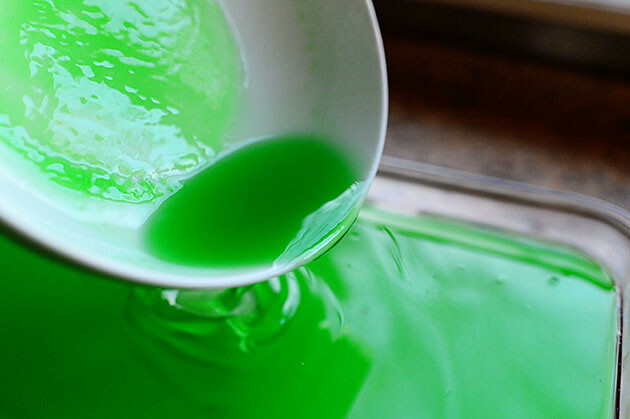 And pour it over the jello layer. 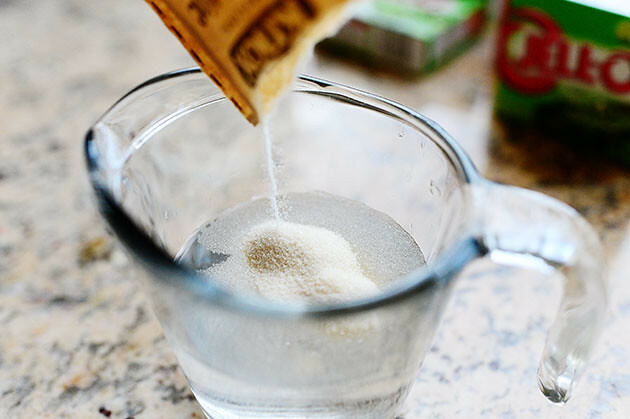 Poke the bubbles with a toothpick, or they’ll ruin your life later. 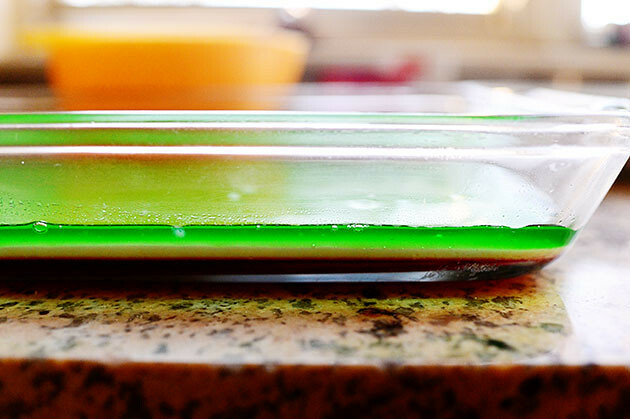 While the creamy layer is chilling, mix up a green jello layer following the method I used for the red layer above. 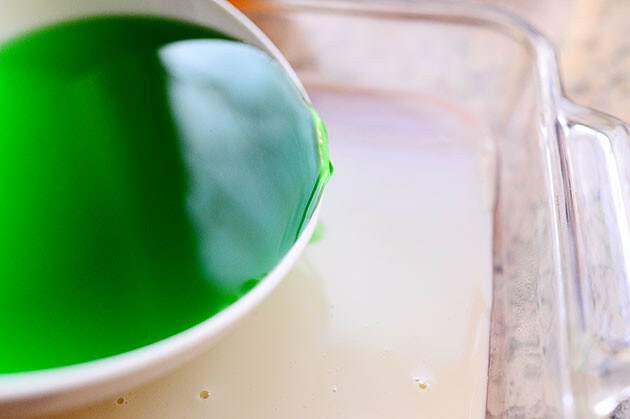 Pull the pan out of the fridge once the creamy layer is set, then pour on the green jello. Now we’ve got three layers! Progress! 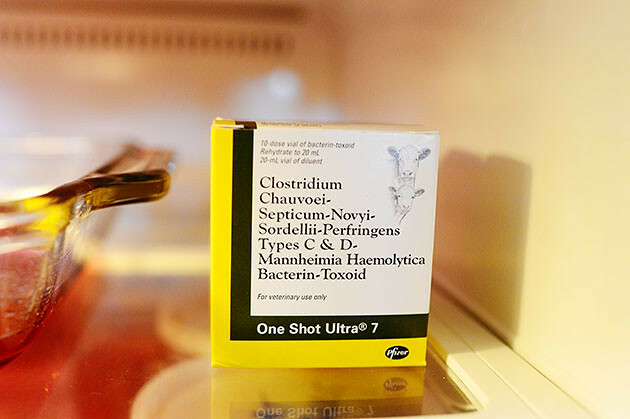 Stick it in the fridge to chill. Or keep going! Whatever your heart tells you to do! 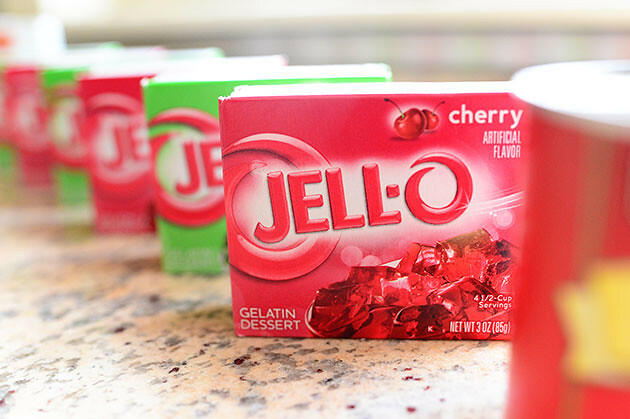 But I was out of jello, man. When the last layer is on, chill it for a good couple of hours to set the heck out of it. 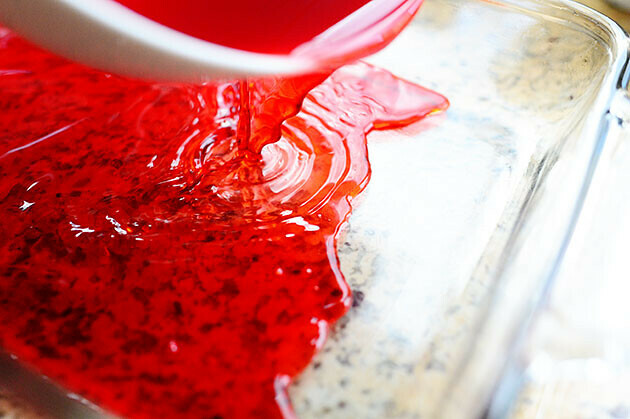 One thing you need to know, if you’ve never tried finger jello, is that it is decidedly firmer than jello made according to package directions. 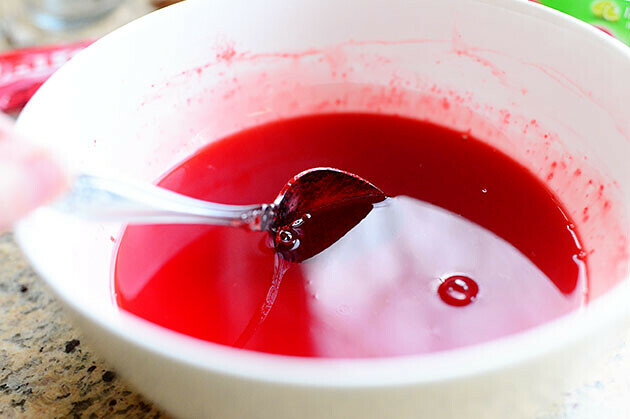 Of course, that’s the whole point; it needs to be firm in order to hold together and be “pick up-able.” But if you’re expecting it to have the slurp-through-your-teeth softness of normal jello, it won’t. I have to tell you, though…I love this stuff. There’s something so fun about it. You can make the squares as small as you’d like and just pop them in your mouth. 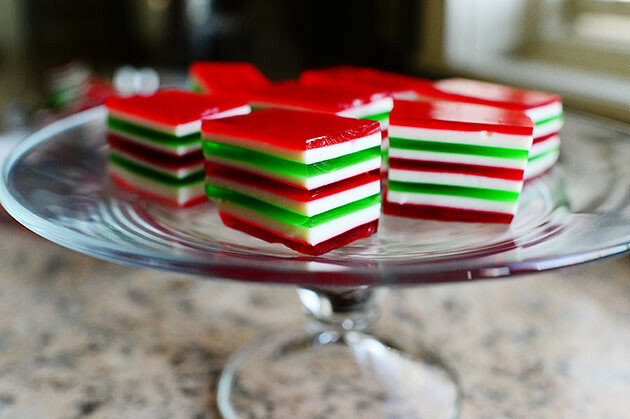 The creamy layer is nice and, well, creamy…and they’re just a fun and festive treat. Try them this week! Another approach you could take is to double the amounts of each layer and have fewer, thicker layers. Might be a little less time consuming. Either way, have lots of fun. 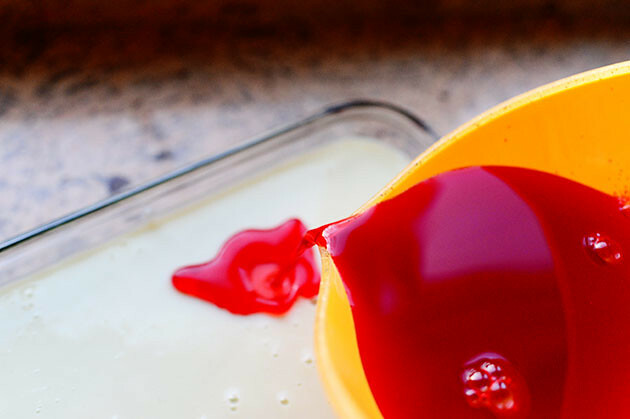 That’s what finger jello’s all about. First: Get organized! 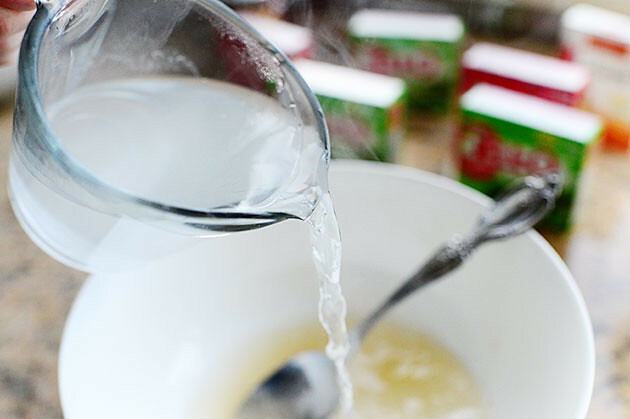 Having a tea kettle full of water helps, as does having at least two or three mixing bowls and a couple of glass measuring cups. This moves faster if you have all the equipment ready! 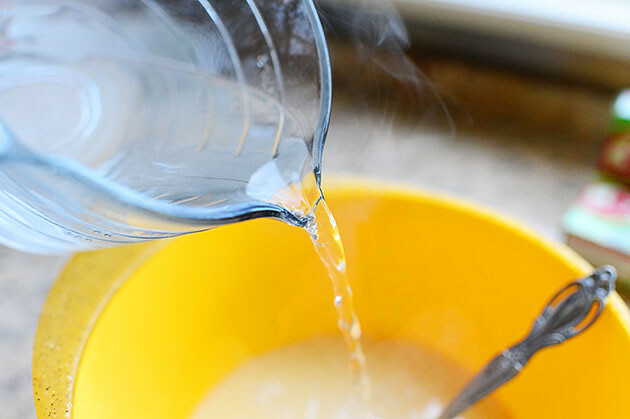 Second: Spray a 9 x 13 inch Pyrex with cooking spray, then give it a gentle wipe with a paper towel to remove the excess. 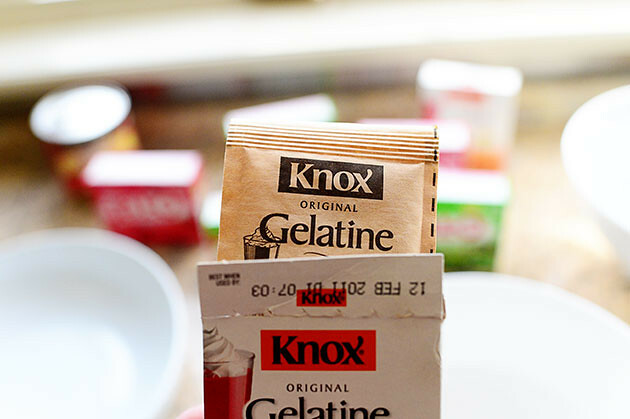 One layer at a time, mix 1 envelope Knox gelatin with 1/4 cup cold water in a small mixing bowl. 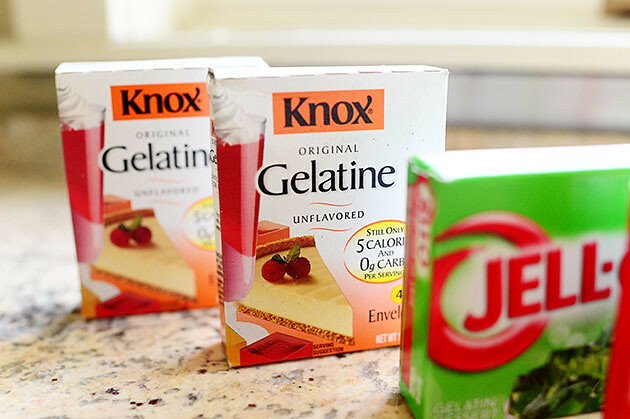 Add 1 cup boiling water, followed by 1 box of either red or green jello. Stir gently to combine so bubbles won't form. 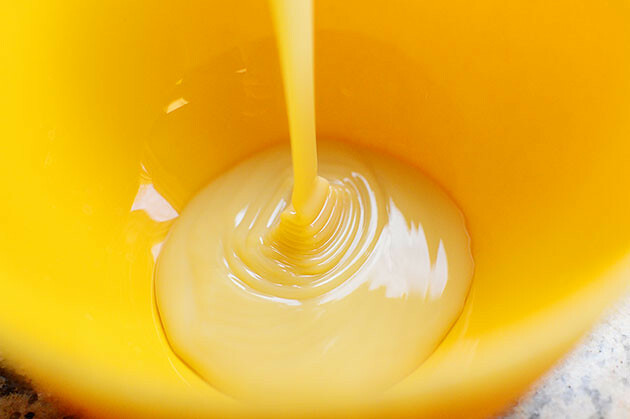 Pour into pan. Place in the fridge for 10-15 minutes, or until set. 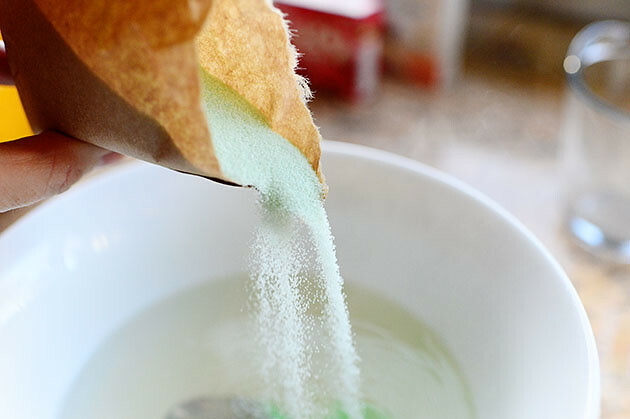 In between each colored layer, pour a creamy layer. 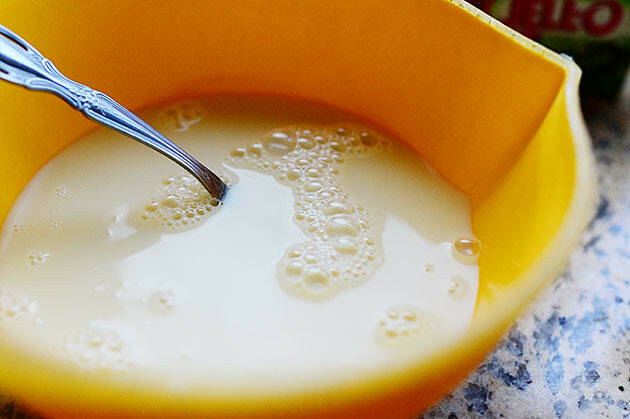 ***NOTE: The following mixture is enough for just under three creamy layers. You'll need two batches before the whole thing's done. 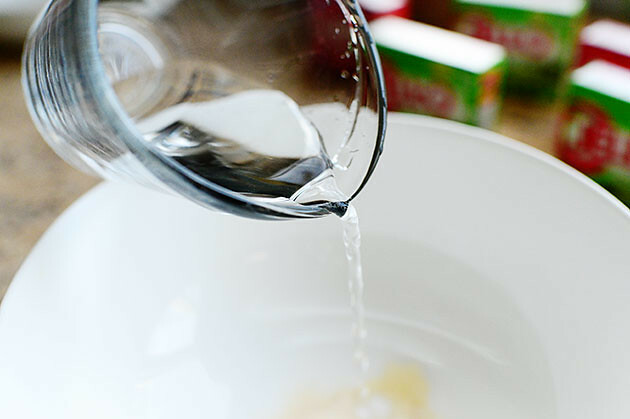 In a small glass measuring cup, measure 1/2 cup cold water. 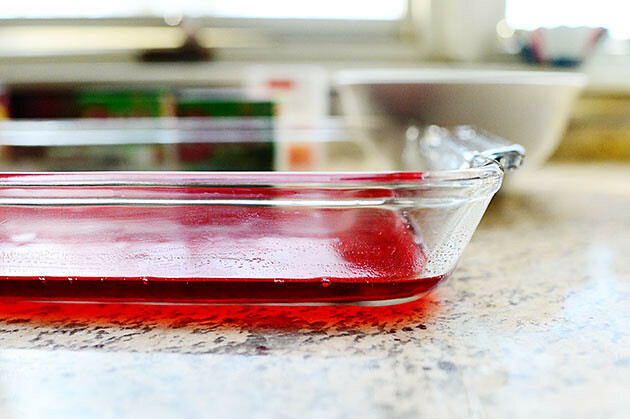 Stir in 2 envelopes of plain jello and stir to dissolve. 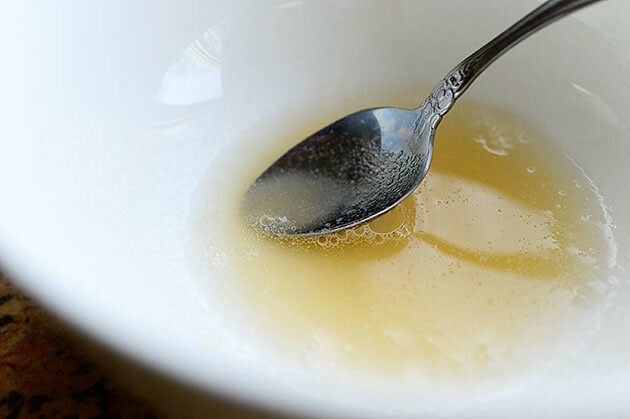 Pour sweetened condensed milk into a medium-sized mixing bowl. Add 1 cup of boiling water. 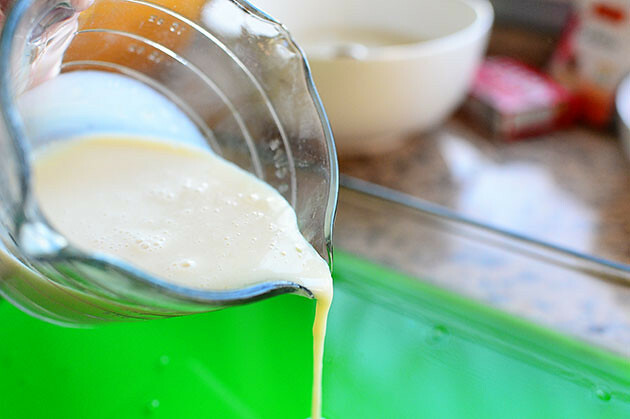 Pour dissolved gelatin mixture into the condensed milk mixture, then add another 1/2 cup of boiling water. 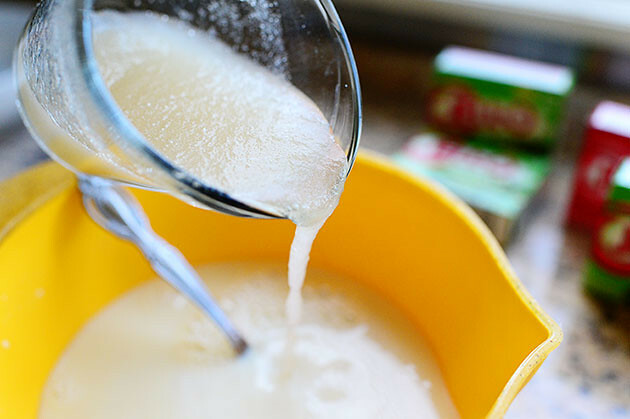 Once you've used all of the creamy mixture, repeat the method below to make another batch. 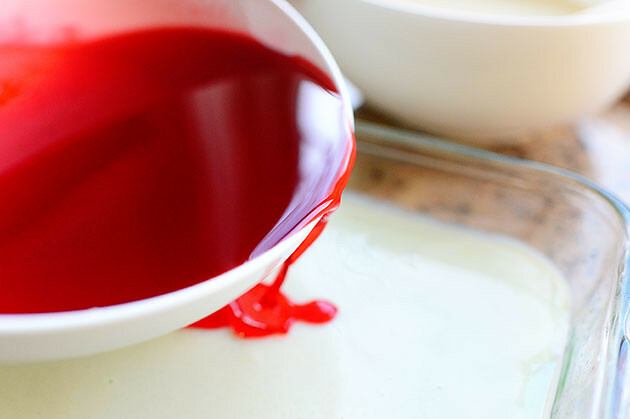 Begin by pouring either a red layer in the bottom of the pan. Stick the pan in the fridge for 10-15 minutes until it's set. 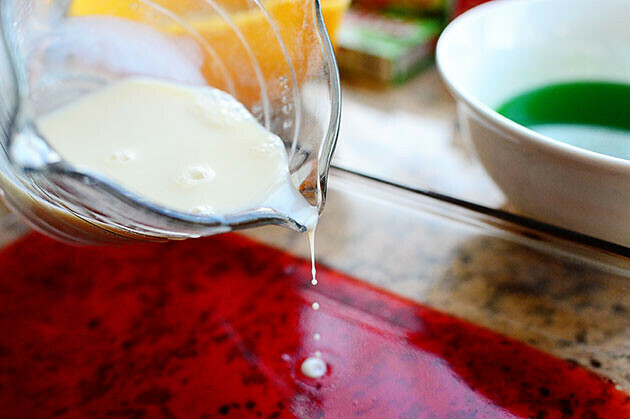 While it's setting, mix up the first batch of the creamy mixture. 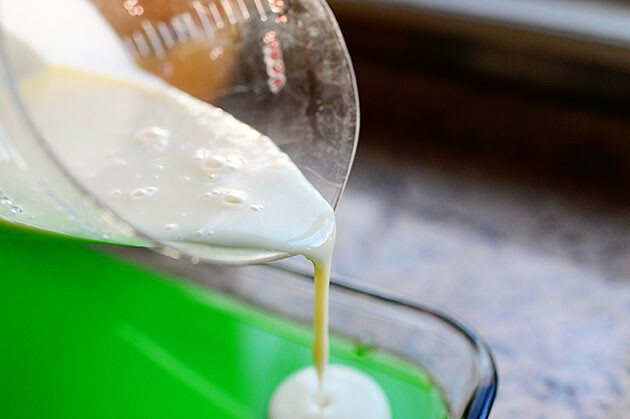 Remove the pan from the fridge and pour in a little more than 1/3 of the creamy mixture (or enough to coat the first colored layer.) Stick the pan in the fridge for 10-15 minutes until it's set. While it's setting, mix up the next colored layer. 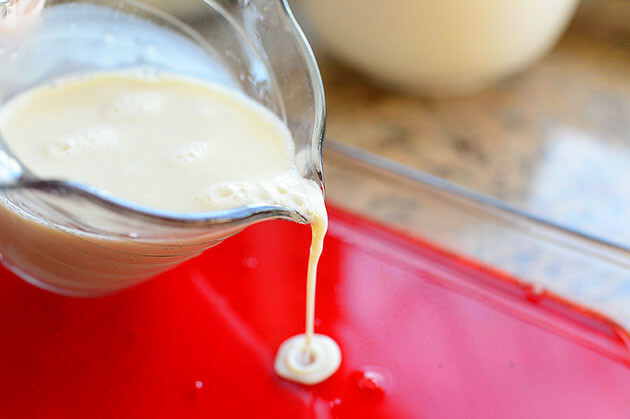 Note that you'll need to mix up the second batch of the creamy layer midway through the process to make sure you have enough for the middle layer. 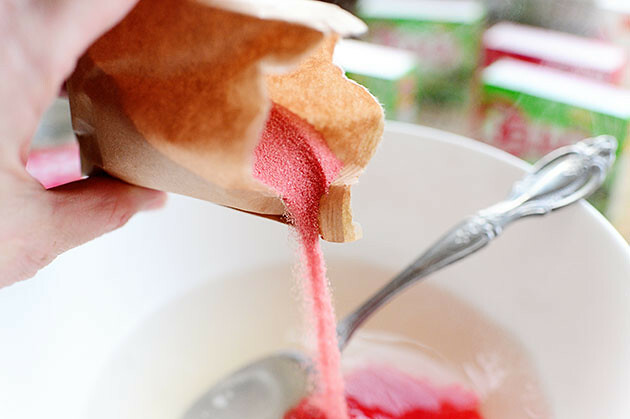 For the colored layers, just mix them right before you need them (when the previous layer is chilling in the fridge). When all the layers are in the pan, chill for a good 2 hours to totally set everything. Cut into small squares and serve 'em as snacks!